I’m building this Westerfield car to make a presentation on building a resin car for the Tracks to the Triangle NMRA regional convention this October in Durham, NC. I kept the kit build fairly straightforward, right down to the resin ladders. The next one I do will use Yarmouth Model Works etched ladders but I didn’t want to completely terrify any resin rookies with the etched ladders! I did replace the sill steps as I think resin steps are too delicate for regular use and operations. The sill steps with the middle step were created by soldering a bit of strip brass into the A Line part. The prototype cars were original built just before World War One as door-and-a-half automobile cars. The NYC and Michigan Central originally installed 6500 of these cars. Most of these cars were rebuilt by narrowing the door opening, eliminating the half door, and installing a new roof. ATSF 136308 is a Speedwitch Media kit, K114.7, of a Bx-26 class box car. The non-cushioned draft gear is a Moloco detail component. I hope it’s reasonably accurate 🙂 And yes, the model is missing the running board lateral grabs. That became a moot point when one of the laterals went missing and the whole assembly was replaced with a Tichy part. 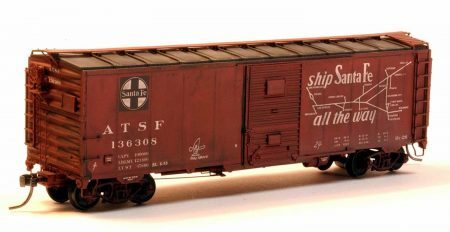 The model was painted with the now-lamented Floquil ATSF Mineral Brown, while the Herby graffiti and chalk marks are decals. My weathering consists of layering on washes of various grimy colors, using acrylic tube paint. Bragdon weathering powders are applied after the washes and Prismacolor pencils are used to create the thin streaks and to highlight rivet lines. Here’s a look at the underframe detail before a coat of paint is applied. The Santa Fe installed 500 of these cars as the Bx-26 class in 1936. A Duryea cushion underframe was an interesting feature of this kit. Some of those details can be seen in the image above. Central of Georgia 56309 is a ventilated box car kit that was produced by Smoky Mountain Model Works and sold through the Central of Georgia Railroad Historical Society. The C of G bought 3000 ventilated cars from three builders between 1922 and 1926. All of these cars followed a similar design with minor variations. CRP 23107 is Sunshine kit 81.12. The Central Railroad of New Jersey owned a subsidiary for Pennsylvania operations, the Central Railroad of Pennsylvania. 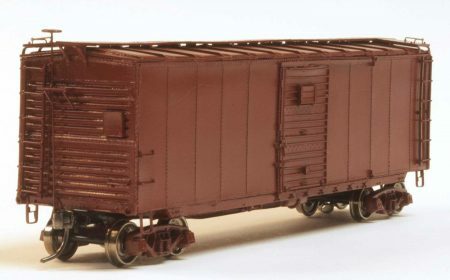 These XM-4 class box cars were installed in 1947-48 and followed the AAR post-war steel box car design, but with a shorter interior height of 10 feet. 1230 of these cars were lettered for the CRP. Pennsylvania Railroad 31002 is Westerfield 6151, an X25 class car that represents the first all-steel box car for the PRR. The Pennsy produced 9,620 of these cars between 1915 and 1919. Youngstown corrugated doors replaced original hardware on many of the X25 cars in a late 1920s rebuilding program. This model was painted with Scalecoat II PRR Freight Car Color. 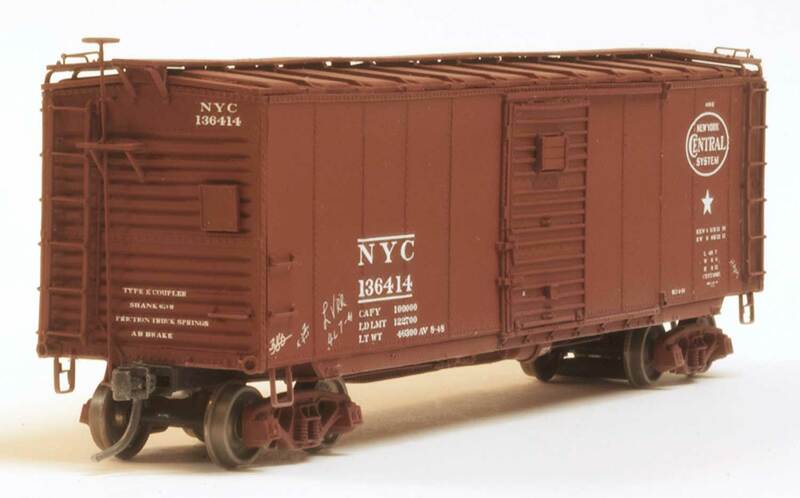 New York Central 194679 is Sunshine Models kit 93.1, “NYC 1 ½ door rebuilt steel box, panel roof.” It was painted with Scalecoat II paint with Speedwitch Media’s superb decals applied for the lettering. Sunshine chalk marks and weathering topped of the appearance. The weathering was a mish mosh of acrylic tube paint washes, Bragdon powders, and Prismacolor colored pencils. The pencils let me make the rivets pop and can add streaks down off the door tracks etc. I also upgrade the brake gear to Tichy if the kit is provided with resin brake parts. Originally a Michigan Central car, 1500 prototypes were rebuilt in the early 1930s to increase the interior height. Eventually, these cars received replacement doors, roofs, and AB brake systems. They were relettered and renumbered as NYC cars by 1950. Delaware, Lackawanna & Western 46501 is another fine Sunshine Models resin kit. It was kit 37.9, a double sheathed car with a peaked Hutchins roof and Youngstown corrugated steel doors. The Lackawanna installed 1000 of these cars in 1926 and 1927. Scalecoat II paint was used for the finish with Sunshine decals and chalk marks. My weathering mish mosh of acrylic tube paint washes, Bragdon powders, and Prismacolor colored pencils finished things off. New York Central 189611 represents an automobile carrying variation of the NYC-modified USRA design steel box car design. The Michigan Central originally ordered 4000 cars to this design in 1922-23. 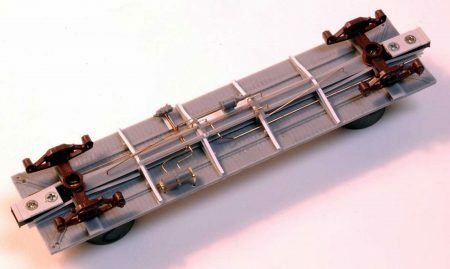 This is Westerfield kit #3002, NYC USRA Steel auto car sealed door, representing a later version with the half-door sealed shut and the car relettered for the NYC. Scalecoat II paint was applied, along with Speedwitch Media’s superb decals, and Sunshine chalk marks. The model was weathered with a mish mosh of acrylic tube paint washes, Bragdon powders, and Prismacolor colored pencils. Sometimes blog posts sit for a few weeks after a final version is approved by the contributor. Craig has been busy since we wrapped up this article in late August. The undecorated box car that led this feature has now been painted with Scalecoat II #2 Box Car Red. And Craig has had the time to decal, flat finish, and weather the car, too. Thanks to, Craig Zeni for sharing several of his freight cars in a virtual RPM display. Questions and comments can be posted below. Please follow the instructions so your comment can be posted. All comments are reviewed and approved before they appear. To subscribe to this blog, enter your info for a comment and check the last box to notify of new posts by email. Share the blog link with other model railroaders. Outstanding work, Craig, and thanks for taking the time to send good photos. Craig, nice job on all your cars. Weathering looks great as well. I think it was Robert Duvall who said in a movie once: “Ah I love the smell of Resin in the morning.” I could not agree more. Just imagine these coupled together—what an authentic train they will make. Well done Craig!